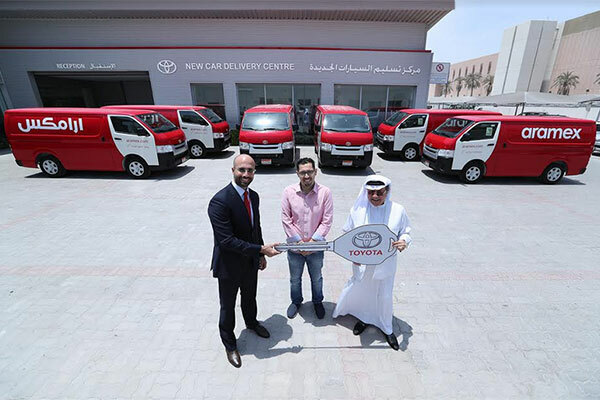 Plus Rental, a leading vehicle rental company in Bahrain, has purchased a fleet of 25 Toyota Hiace vans from Ebrahim K Kanoo, authorised Toyota dealer in the kingdom, for use by top shipping company Aramex. Aramex station manager Omar Kamarand, Plus Rental managing director. Mahmood Al Khadhem received the fleet from Ebrahim K Kanoo executive general manager of Sales Ismail Akbar, at the New Car Delivery Center at the Toyota Showroom in Sitra.